I recently heard a ministry official summarize the challenges to increasing immunization in an area suspected to have a high number of unimmunized children. This was very different from the story told by the numbers. The administrative coverage rates (based on census numbers and the reported number of administered vaccine doses) for the region were well over 100%. Surveys designed to provide a baseline comparison in the same area reported lower numbers, but the data still showed surprisingly high coverage – above 80%. People at this meeting quickly said they were ‘tired’ of hearing about coverage rates because of the well-known data quality issues. This frustration with data quality has echoed at nearly every immunization stakeholder meeting I’ve attended. Clearly inaccurate data is less meaningful – and less useful. It could be worse than no data at all. When VillageReach began work with the Supply and Awareness Technical Reference Team for the UN Commission on Life-Saving Commodities for Women’s and Children’s Health to document promising practices in supply chain management, I was both excited and daunted. Excited because there is a growing recognition that strengthening supply chains is a fundamental aspect of increasing access to medicines and quality healthcare at the last mile; daunted because while there is so much work being done to improve supply chains in low and middle income countries, documentation and evidence of these interventions can be hard, if not impossible, to find. We often cite the challenges we see in determining optimal approaches to strengthening health systems, many of which are due to the lack of current data about the health of communities and the performance of the health system. This critical gap in useful data to inform better decision making led us to form the Information Systems Group (ISG) at VillageReach, charged with developing new innovations and approaches in information communications technology (ICT). In many cases, the reporting and requisitioning of medical commodities in low-income countries has been driven by paper-based processes. These are labor intensive, and prone to communication delays and human errors, but remain the accepted practice in areas with minimal ICT infrastructure. Today, however, communication networks are being deployed in a growing number of rural communities in low-income countries, making the broad-scale deployment of an electronic logistics management information system (LMIS) not only practical but inevitable. To address this opportunity, a significant amount of our work in ISG is focused on OpenLMIS, a collaborative, community-focused initiative to create an open source electronic LMIS for health commodity supply chains in low-income countries. With a growing number of partners, the initiative is focused on meeting our goal of designing, developing, and sharing open source software, tools and methodologies, from which Internet-enabled LMIS can be developed and customized for country deployments. With OpenLMIS, we see the opportunity to enable ministries of health and their partners to improve their replenishment process, but also to gain access to critical information that contributes to optimal decision-making – this ranges from the facility manager at a health center who wants to submit a requisition, to a packing clerk at the warehouse who needs to fill an order, as well as related stakeholders who want real-time visibility into how well the supply chain is performing. With that greater amount of information at their disposal, we expect healthcare administrators to be able to make more accurate and timely decisions that improve health system performance, including limiting stock outs of essential medicines and vaccines, and reducing interruptions in service delivery due to stock shortages and health worker absences. With our partners, we have developed a detailed set of requirements for a new electronic LMIS that can be customized, configured and deployed in multiple countries. The first phase of software development has been completed, providing a core platform for future development of deployable LMIS solutions. Development has started on the second phase – a general but configurable system that includes features and functionality needed to meet basic LMIS requirements. A number of countries and financial supporters have expressed strong interest in deploying the solution. In addition to these software development milestones, the OpenLMIS community itself is expanding. The Bill & Melinda Gates Foundation, the Rockefeller Foundation, PATH, and USAID are providing essential funding for the initiative, and John Snow Inc., PATH, and the Tanzania and Zambia ministries of health are contributing valuable input to define requirements and functionality for the solution. Management Sciences for Health (MSH) has also recently joined the initiative. We’re very excited about the new phase of work we’ve started and look forward to releasing updates later in the year. For those interested in more detailed tracking of OpenLMIS’ progress, please visit the OpenLMIS Repository regularly for updates. When I trained as a midwife, I had no idea that I would be helping deliver babies over the phone. Technology has come a long way, especially in the district of Balaka in Malawi. In September of this year, Mercy, a 24 year old pregnant woman from Dailesi village in Balaka, told her family that she wasn’t feeling well, and set out for Kalembo Health Center seated on the back of a bicycle driven by her neighbor. Dailesi village is 12 km away from Kalembo, the nearest health center, and is located in a hilly area far from paved roads. The only transport available is by foot, by bicycle taxi, or – in case of emergency – by ox cart or bicycle ambulance. After an hour of traveling, Mercy started feeling intense muscle contractions signaling the birth of her baby and could no longer sit on the back of the bicycle. Mercy asked the bicycle driver to stop in a nearby village so that the women living there could help her deliver her baby. With no other transport available, still far from the health center, and without any skilled personnel nearby to help with Mercy’s delivery, her neighbor decided to call Chipatala cha pa Foni for assistance. Chipatala cha pa Foni (CCPF), which translates to “health center by phone,” is a toll-free hotline that women in rural Malawi can call to speak directly with a hotline worker for information on pregnancy, newborn and child health, and reproductive health issues such as family planning. A VillageReach project, CCPF provides clients with advice they can follow at home, or refers them to a health center or hospital if they’re displaying “danger signs” which require further care. Women in the community can also sign up for CCPF’s “Tips and Reminders” mobile messaging service to receive regular text or voice messages tailored to their week of pregnancy or their child’s age. Besides information and referrals, CCPF has also linked key services to the community, as in the case of transport. After visiting the CCPF Hotline Room, the Balaka District Transport Officer was so impressed with the potential of CCPF to save lives that he offered to assist in arranging transport logistics for callers in critical condition or in need of immediate care. He gave us his telephone number and requested that we let him know of any emergency transport needs. Less than one week later, we took him up on his offer when Mercy called the hotline. Rose Nkupsya, a nurse and CCPF hotline worker, answered the call from Mercy. Rose understood the urgency of the situation and informed the transport officer. He immediately responded by sending the district ambulance to pick up Mercy and bring her to the nearest health facility. Before the ambulance could reach her, Mercy delivered a baby boy. Mercy was bleeding heavily when the ambulance arrived and needed to be helped by health workers. But she was afraid of being reprimanded by them for delivering her baby outside of a facility and was concerned that the nurses would not admit her. Over the phone, Rose reassured her, and Mercy agreed to go to the health center where the nurse on duty was able to stabilize her condition and successfully stop the bleeding. Had it not been for CCPF and the transport officer, Mercy would have suffered severe bleeding and infection. Fortunately, she and her baby boy received timely and appropriate care, and both are happy and healthy today. Chipatala cha pa Foni provides an important service to women in four districts of Malawi, but our work is far from finished. I look forward to continuing to help women have safe pregnancies and deliveries and for children to grow up happy and healthy. In Malawi, more than eight in every one thousand women die from maternity-related causes, while almost 90 percent of childhood deaths occur during the first year of life. Malawi women have a 1 in 36 chance of dying during childbirth. Reducing the maternal mortality rate in Malawi not only saves the lives of women, but most maternal interventions will also reduce mortality and morbidity among infants. Moreover, saving the life of a mother can protect older children; orphaned children have a three to ten times greater risk of death than those with living parents. In October and November 2011, VillageReach conducted a needs assessment to identify the barriers to optimal maternal and neonatal healthcare in Kwitanda, Malawi through interviews and focus group discussions with health workers, health surveillance assistants (HSAs) and women in the community. The results pointed to the major barriers to optimal maternal and child healthcare as long distance to the health facility and lack of transportation for antenatal care (ANC), delivery and post-natal care, perceptions of poor treatment and safety at hospitals compared to delivering with Traditional Birth Attendants, traditional beliefs maternal and infant health practices and when and where to access care, and a general lack of knowledge regarding the importance of early post-natal care. Extend the Reach of ANC services to the community Currently, ANC services are offered at Kwitanda Health Center but women have expressed a great interest in these services being provided closer to home. We will leverage existing structures to conduct ANC outreach clinics by Kwitanda Health Center staff closer the community. ANC outreach is scheduled to begin this month. Train Additional HSAs in Maternal and Neonatal Health With funding from The Seattle International Foundation, VillageReach will train and support additional HSAs in maternal and neonatal health to extend the cadre available to visit women in their homes. Currently, five HSAs in the Kwitanda catchment are trained in MNH. The specialized cadre of HSAs can provide home-based postnatal care to all newborns, track the health status of pregnant women, encourage ANC visits and facility-based delivery, and support women in the development of a birth plan. Nine HSAs are currently in training. Leverage Existing Maternal and Neonatal Health Services Provided by VillageReach VillageReach’s work with MNH through the Chipatala Cha Pa Foni (health center by phone) case-management hotline service was rolled out in the Kwitanda area in March. The hotline provides health advice and information to pregnant women and caregivers of children under-5, refers individuals to a health center or village clinic if warranted, and registers women and caregivers for an automated tips and reminders service sent to their phones or accessible through phones of community volunteers. The hotline provides direct access to a health worker for community members who may have previously had a poor perception. Thus, in addition to providing direct advice, the hotline serves to improve community trust in the health system. 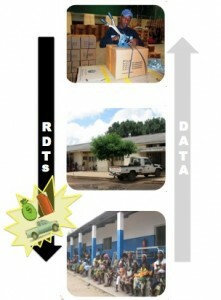 Rapid Diagnostic Test (RDT) Data and Distribution Systems. As a partner in Mozambique’s health system, VillageReach is undertaking a study about the shortage of RDTs in the rural health centres. This is the second in a series of updates we expect to provide on the work – see the first post here. The study will conclude this fall. The study involves gathering and analyzing data that health workers collect as they provide testing services, and using that data to analyze consumption as it informs the test distribution. 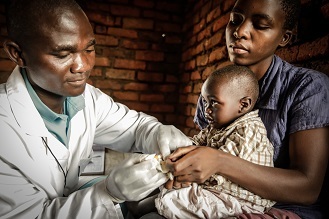 Data about the use of RDTs is critical to operating a well-functioning supply chain and ensuring that health centers have the right tests at the right time. This data allows planners in the health system to purchase the right quantity of tests and distribute them throughout the health system while minimizing wastage and expiry. 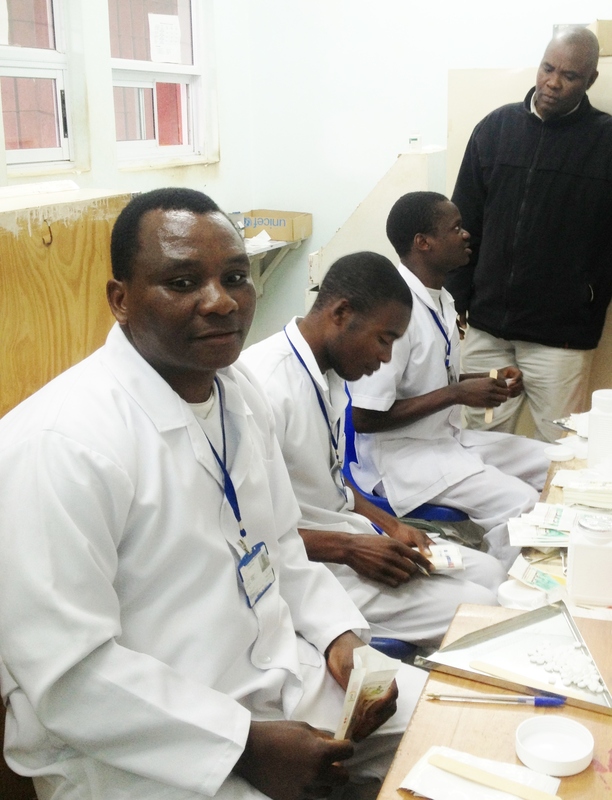 Until now, the national health system in Mozambique has not distributed standardized forms for collecting this data. However, the lower levels in the government recognized the need and value of the data and implemented their own systems. In the first visit made by the study team in January this year, it was found that the data collected was of very poor quality, due to lack of standardized instruments or forms to use for recording data and a lack of training for the health workers. The forms used to collect the data were undergoing numerous changes, which complicates the process of data collection at the service delivery point. 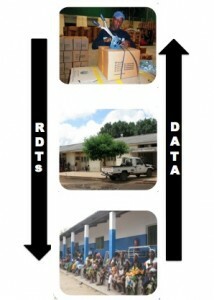 The system for distributing tests and collecting data about tests was designed with the following flow: the RDTs are amassed at a provincial medical store, redistributed to district storage facilities, and then transported to rural health centers. The image on the left represents the ideal. Last week we visited again and found that key improvements had taken place in the last four months. 1. Systems and processes are in place to collect data about the use of tests. These are being used properly and routinely. This is no small feat in a country so vast and full of infrastructure challenges that can limit access to the health centers. 2. The Logistics Management Information System is installed and in use at the district level. That is a major accomplishment, and one that will improve the distribution and supply of medicines throughout the country. But this visit revealed another fundamental observation. Despite improvements over the recording and availability of data about test consumption, there continues to be shortages and stock outs of tests in the health centers. Specifically, I observed situations where there were too few RDTs and a number of them had expired before being used. If the data is there to make the system work, then what is happening? •	Where there are vehicles and fuel, there is a chronic lack of allowances for personnel to carry out the distribution of medicines. These factors greatly influence the availability of RDTs at the health center level. With delays in distribution, RDTs may expire before they are used, ultimately reducing the quality of service at the health centers. All this ultimately results in poor distribution system of RDTs used in the province and a higher cost of distribution. In addition, the lack of regular distributions results in incomplete and inaccurate data about the health centers being reported back to administration levels within the health system. This image on the right represents what we see in reality. These factors, all too common occurrences for health systems with limited resources, highlight the importance of improving the quality and capacity of the underlying infrastructure the health centers depend on in order to support so many remote communities. After spending nearly two weeks in an intensive course offered by the Institute for Health Metrics and Evaluation for its incoming fellows (and a couple of fortunate UW graduate students like me), I have an even greater appreciation for the role of evaluation in our work in global health and for the complexity and difficulty in doing it well. In her lecture on Evaluating Health Programs, Dr. Emmanula Gakidou, pointed to what is called “The Evaluation Gap” where billions of dollars from international donors and national governments are being channeled into health programs in low and middle income countries but we know relatively little about what programs are working and how well they are working. The reason being is that most of them are not rigorously evaluated. Even while researchers continue to develop and test new interventions such as vaccines, diagnostic tools, and drugs through thorough clinical research, we don’t know how best to deliver them in countries with weak health systems. The result is an innovation pile-up where proven interventions to prevent and treat disease are available yet millions of people are dying because these interventions don’t reach them. As a graduate student in public health, it seems to me that the field of global health is turning in this direction and placing a lot more value on measuring impact. As President Obama said in his speech at the MDG Summit; “let’s move beyond the old, narrow debate over how much money we’re spending and let’s instead focus on results-whether we’re actually making improvements in people’s lives.” We need to know what is working and what isn’t so we can better our efforts and get the interventions out to the people who need them. VillageReach makes a sincere commitment to evaluation of its programs and has ever since its inception. For example, as we begin to scale-up the Dedicated Logistics System in Mozambique, we are engaged in operations research to inform our program decisions. In addition to routine monitoring, we are conducting baseline evaluations in every province followed by process and outcome evaluations. We want to know what is working and more importantly, what isn’t working and why, so we can ensure that the resources we put into our programs really make improvements in people’s lives and that those interventions make it to the people who need them. We’ll keep you posted on our progress.